Ah yes, the real reason I do this dangerous and thankless job, the insurance, Truman thought to himself. "If you two are almost done..." Truman started, opening the room's door just a crack to see outside. Truman yawned, squinting to try and make out what was going on outside. You peer at the door, but the commotion of some patrons leaving prevents you from having a clear view of the room. You call upon Chorden for assistance, and the kobold once again proves his reliability as a scout. 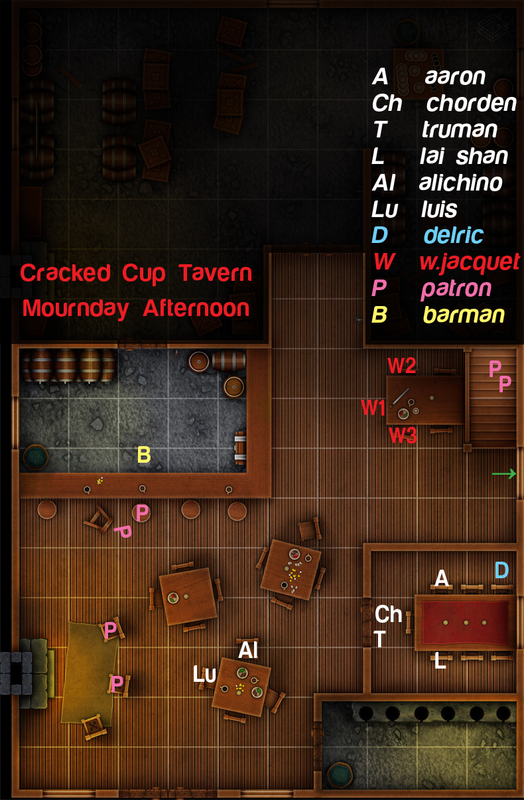 Together you notice that Figg is gone from the bar, with only one of two servers left working in the tavern. Most customers have left, save a few in the far corner and three familiar folks in cloaks—the Queensmen from the Library. White Jacquets. Lai Shan side-eyed her lizard companion. It was easy to forget that the Kobold's considerable talents were perhaps only matched by his greed. Not an unwanted trait, nor a trait uncommon to this lifestyle, but a negotiation faux pas nonetheless. "We can draft up a proper contract once we finalize the details of the operation, then we can begin talking payment." Lai Shan added, with a raised finger. "After all, there are additional operation expenses to consider; props, bribes, alcohol..."
She trailed off the moment she noticed Truman's attention elsewhere. Truman was a professional, and especially distrusting of strangers; if his eyes were off the client, something more urgent must have come up. "Something the matter, Mr. Truman?" "We've got company. Queensmen, same three from the library. We need an exit plan, stat." Truman's hand came to rest on his blade, the Last Resort, for a just moment, before he drew it back to the door to pull it closed. "I doubt it needs saying, but I'm sure Figg would prefer we not bloody up his bar." Lucy fishes out 3 coins from her sleeve and smoothly lays them on the table with her paws. "Oh the Carnival is in town? I'm merely a wandering merchant of goods and games from all across the land so I must not have noticed~"
She coyly placed a finger on her chin, in a playful gesture of thought. "Perhaps I should have a talk with them and set up shop there too. Now, heads or tails?" Lady Gallivante smiles. "Oh yes, the Green Fairy Carnival has just arrived! It's been some years since they've been by. You'll find the big top tent set up at the Arena..."
She pauses, then makes her choice. "Tails, of course!" Lucy eyes carry a smile, her mouth masked behind a veil. One by one, she flipped each coin, slamming each one down on the table as they fell and revealing the result. "Today seems to be a fine day for you, Lady. Would you like to play another round?" Lai Shan leaned over to the door to peek at the outside. "It doesn't look like they're here for a search. We have some time, let's plan this carefully." Lai Shan made a count of everyone's relative positions before returning to the table. "I can easily sneak out without problem and I can even take Chorden with me, though I wouldn't want to leave the rest of you behind. I trust there are those of us who are adept at making inconspicuous exits..."
She nodded at Truman, ever the capable scoundrel. "...but I admit concern for those of us who can't." She glanced over at Aaron and the still somewhat tipsy Delric. "And to complicate matters, there is still our inebriated watchdog outside. I hope he trusts you enough to take that coffee, Aaron, or else his impulses might cost us this chance." Luis, short-nerved as he was, always proved an obstacle to effective planning. But Lai Shan was already a step ahead. "Thankfully we are in a bar, and no one would think twice if someone were to, say, suddenly burst into loud, boisterous song. Nothing grabs attention quite like the melody of drunken stupor." Lai Shan reaches into her purse and produces a jade-colored velvet beret that matched her emerald-colored dress, adorned with a diamond-shaped brooch embedded with a crystal that seemed to shift colors each time it was kissed by the light, and a long white plume. As she fastens the hat to her head, she snaps her fingers and in less than a blink, she suddenly takes the appearance of a bland tavern girl with fair but blemished skin, dirt-brown hair, a simple cotton dress and a dirty apron. With another wave of her hands, a wicker basket suddenly appears in her hands, with a tall stack of dirty washcloths. She invites Chorden to leap into her arms, using the illusory basket as cover. "Chorden and I will take our leave. Now then, who here has strong singing lungs?" Using Hat of Disguise to disguise Lai Shan as a human tavern girl. Using Minor Illusion to create Illusory Washcloth Basket. Gears began to turn in Truman's head. "Grok, can you send a message to the odd looking fellow bothering Rios? Get him to make a scene." "Delric, you have any skills that may come in handy here? Magic, subterfuge, anything?" As Chorden scampers into her arms, Lai Shan looks back to Truman one last time. "See you on the other side, chief." With a wink, she leaves through the door and into the bar. Mimicking a face of hurried concern, she briskly walks the basket from the back room to the front door, careful not to bump anything or anyone. Delric whispers his assurances as you prepare to leave. "The fee is inaccessible but VERY secure. Once Rugo's place is taken care of--and the tide changes--you'll get the rest of the gold." "I am no stranger to guile and subterfuge," Delric answers. "Just point me where you want me..."
"What ho' miscreants!" a patron shouts as she bursts in. It is the familiar presence of Anna Star, a notable player in the local underground that you've recently become acquainted with. From the large sword on her back, it's clear she's ready for anything. As you enter, you see three men in brown cloaks, each unknown to you. Over at a table you see some recent acquaintances, though you can't quite recall their names. You break for the entrance in your barmaid disguise, past Luis and the new man at the table, right past the three White Jacquets, and right into a familiar tiefling--Anna Star, a very recent but friendly acquaintance and potential business partner. Lady Gallivante hesitates, then waves her chubby fingers excitedly. "Yes yes, again! I still say TAILS!" Her butlers huddle close, paying extra attention to the game now. The tortoise begins crawling forward, growing impatient. Perhaps his mistress's pace is too slow even for him! “...What in the world are you talking about?” Luis wasn’t able to keep up with Curtis’ quirky way of talking. And he was probably still poisoned for all we knew. However, seeing Curtis writhe from a tummy ache sounded amusing; Maybe he shouldn’t have said anything about the food. Luis tried to focus on listening to the White Jacquets on the other table, but it seemed a task impossible. Between a lingering headache, the common sound of a bar, and Curtis, Luis wasn’t sure what to blame. And just when Luis thought the surprises had stopped. It was hard to mistake that sword, that looked comically large for the tiefling to be able to actually carry. But Luis himself was a dog that glowed blue, why would he find this uncommon now. “She’s… Going to get into trouble...” He whispered to Curtis, not losing sight from Anna. Clenching his fist, he reached Monomythica’s amulet, just in case he’d need to summon her aid. Luis was getting nervous again. Hopefully his fur would give no hint of that. It was odd, but a familiar odor hit your nostrils, though not completely sure yet where it came from. Reminds you of Lai Shan but might have been a coincidence. You didn’t see her come out of the backroom. Both Tieflings and Shifters have a bad reputation for being destructive in their path. It was best to not give people more reason to believe such stupid stereotypes. "Very well. Another 3 gold? Or perhaps more? There is no sin in betting less, however." Lucy began flipping one of her own coins and catching it." Lai Shan puts on a weak smile and shuffles past Anna nervously, walking outside the bar, around the corner, and into an alleyway where she kneels down to set the "basket" down. Lai Shan's dismay was palpable. Not because she thought the kobold's plan was bad; on the contrary, it was because the plan was optimal. It was, however, an act that she found in poor taste, and had grown rather tired of. "Alright, you'll have your distraction, simple enough. I should warn you though that there's a considerable chance that you might draw the Queensmen as well. Just be prepared to get those little legs running, you'll know the signal when you hear it." Expertly, she stumbles in through the doors of the Cracked Cup in a flustered panic. "S-someone, HELP! That horrid little kobold stole my precious pendant!" As per the role, she quickly craned her head left and right, until she locked onto Anna and clutched her shoulders with her hands. "P-please! You have to stop that thieving scamp!"